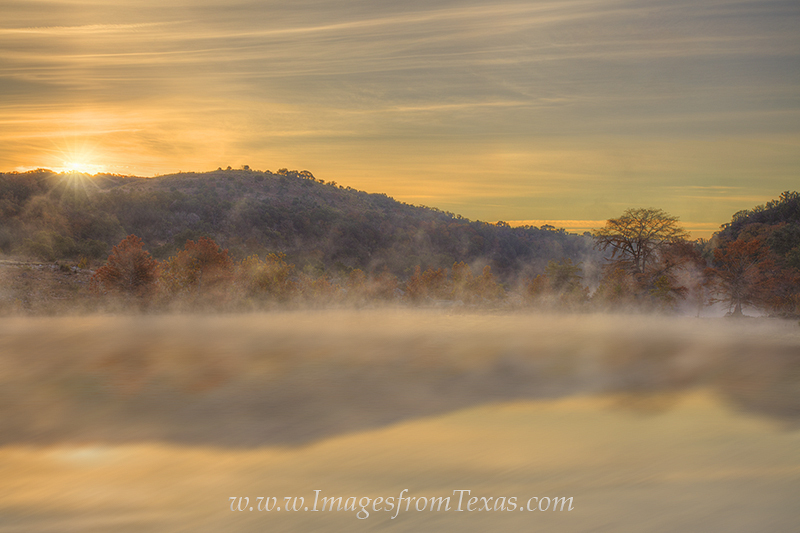 This image of the Pedernales River is a composite of 2 several photos. Taken at sunrise, the first batch of photos is used to show the colorful trees and distant ridge, along with the sunrise and high clouds. The second image used a filter to take along exposure of the foreground and fog, giving the landscape a dreamy feel. I wasn’t sure how this would turn out, but I like the colors and the final product in this Texas Hill Country Autumn image. This image of the Pedernales River is a composite of 2 several photos. Taken at sunrise, the first batch of photos is used to show the colorful trees and distant ridge, along with the sunrise and high clouds. The second image used a filter to take along exposure of the foreground and fog, giving the landscape a dreamy feel. I wasn’t sure how this would turn out, but I like the colors and the final product in this Texas Hill Country Autumn image. Photo © copyright by Rob Greebon.